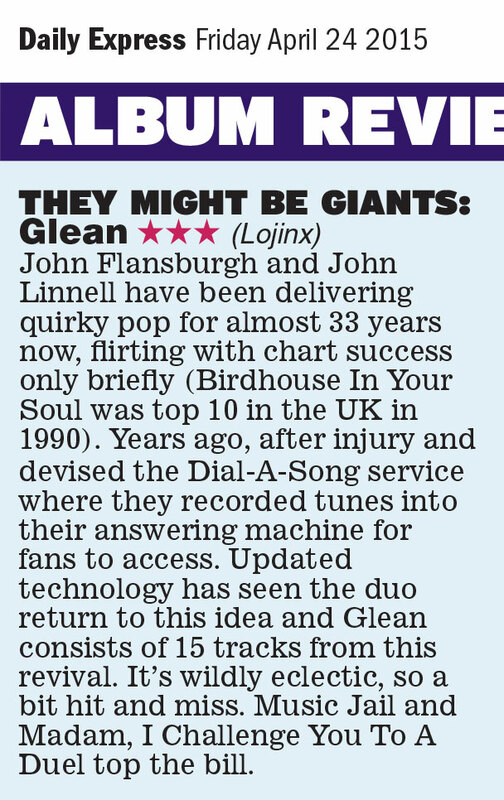 "The songs are as sharp as they are varied"
"‘Glean’ contains a hugely varied range of recordings, comprising of some of They Might Be Giants’ best work of their 30+ year career, and sees the band as exciting and original as ever. " "'Glean' reaffirms the fact that They Might Be Giants are still the quirky, highly intellectual titans of indie rock." "They Might Be Giants has yet another album of fine material to their name"
"The overriding emotion one is left with after the album’s forty minutes is through is a delirious sort of joy." "Dial-A-Song is back, but adapted to 2015 technology. One song a week, posted on youtube. An exhausting activity – Glean is a compilation of it’s best results." "What is clear is that they have lost none of their charm and ability to defy genre"
"Glean is another enjoyable entry in the They Might Be Giants canon"
"An oddly satisfying infusion of classic and pop-rock"
"Glean marks a new era of They Might Be Giants"
"A subversive slice of retro-laced indie rock that is something of a blast"
"They Might Be Giants are three decades into their career and still making multifaceted, relevant, intriguing, well constructed music"
"After all these years They Might Be Giants continue to defy genre labels, to the point where they are now simply their own genre. Underestimate them at your peril."